The barn was used to dry hay crops. The roof is made from sheets of corrugated iron. There are two types of vent on the barn. One, the older type, forms the gablet of the wall facing the camera. It is made of upright sticks with heather interwoven, a technique known as 'stake and rice'. The side walls have a more modern type of vent, with louvres. 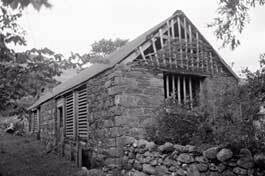 These barns were needed because of the damp climate and the difficulties in drying hay outdoors by the usual means.